1873 NSU was established by Christian Schmidt and Heinrich Stoll in the year 1873 near the river Donau in the German town Riedlingen. After seven years of production the company was moved to Neckarsulm. In it’s first twenty years NSU produced knitting machines. Starting in 1886 the ‘Neckarsulmer Strickmaschinenfabrik’ also produced bicycles. From that moment on, bicycles would play a major role throughout the existence of NSU. 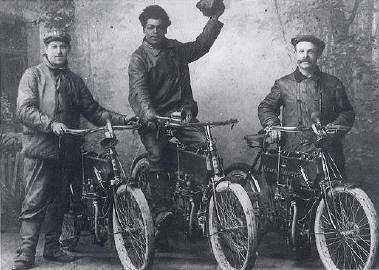 Production of motorcycles started in 1901, followed five years later with the first automobile. The production of automobiles was stopped in 1929, so the company could fully concentrate on the bicycles and motorcycles. It wasn’t until 1958 before car manufacturing was restarted. On 10 March 1969 Auto Union GmbH based in Ingolstadt merged with NSU Motorenwerke AG at Neckarsulm. 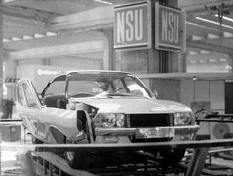 The new company was to be called Audi NSU Auto Union AG with its headquarters at Neckarsulm. PLANS Early sixties, when NSU was only producing small cars, they decided to built a big, exclusive motorcar to emphasize the advantages of the newly developed Wankel engine. The NSU Wankel Spider was merely a cabriolet version of the NSU Sportprinz. NSU had quite a reputation for building exceptional cars, be it for technical or for styling reasons. 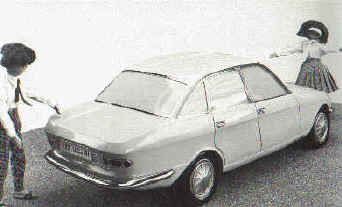 The NSU Ro 80 can be regarded as the final outcome of the development, which took place within NSU. 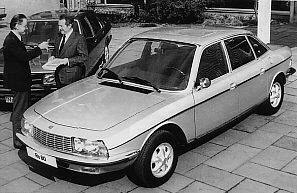 You even could say, that the Ro 80 was a car built by engineers for engineers. On these pages you can find some highlights of the development of the Ro 80.The Ro 80 is the companies’ evidence for the slogan "Vorsprung durch Technik" (A leap because of technology or Advance thanks to Engineering). It was in the castle "Wald-und-Schlosshotel" at Friedrichsruhe (yes, it’s still there…), about 30 kilometres to the east of Neckarsulm that the final outlines of the Ro 80 were embodied by Ewald Praxl (Project-leader), Walter Froede (Research), Sussner (Production) and Strobel (Construction). 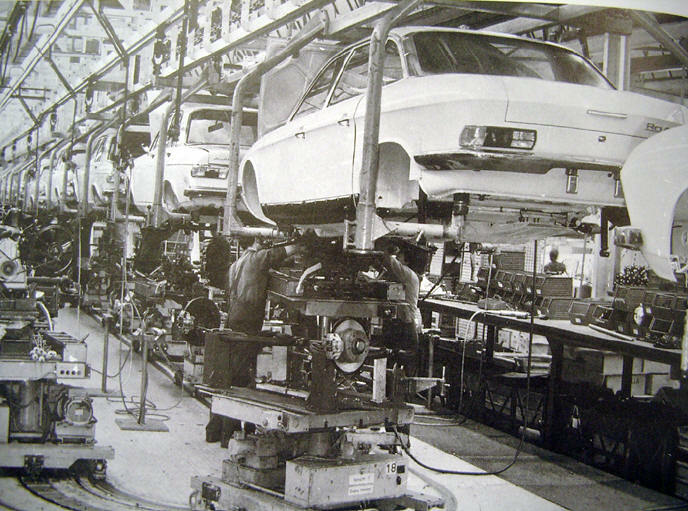 You could say that it was here where the NSU Ro 80 was born! Middle-class, like Ford’s 12M, boot just like it, sporty, two doors, possibly sliding doors. Two-rotor Wankel engine placed in front, rear-driven, gearbox with lock-differential. Luthe is 30 years of age and since 1956 working with NSU. 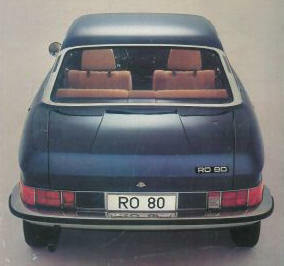 He knew the Ro 80 was a thirsty engine, so it was evident that the body should be well shaped. Streamline, aerodynamics and Cw-values were hardly points of issue those days; something revolutionary had to be built! With the help of only six people Luthe made the first prototype in scale 1:1, neatly finished, sprayed and polished as if it was a showroom model. Already with the correct front, bumpers still a bit rough, wheel arches too rectangular. The bonnet closes right to the windshield. This wooden model has an internal steel construction in order to have a look at the interior. The interior itself was designed in May 1964. 8. 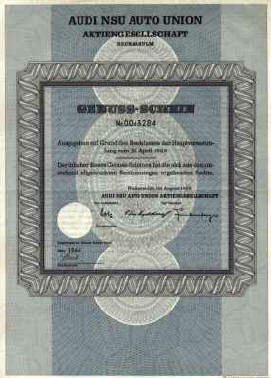 Mei 1964 Presentation for the board of directors. Dashboard rejected. First cars made for testing. Prototype’s: 16 and pre-production: 18. (Made between 7 April 1966 and April 1967). Engine bay painted black. Bumpers blind-welded. Clothe headlining. Wood imitation on dashboard. Wankel (Rotary) sign on steering wheel. Modern details: the headlamp housings with integrated flashing lights. Beamers beneath the bumper mounted in the spoiler. Enormous glass area. Regarding the name Typ 80 we must note that this name could not be used as Mercedes had a record car with that name. Because of the Rotary Club, Rotary 80 was also not an option. The name NSU Delphin was rejected because of its similarity in name with Renaults Dauphine. Even Rota was rejected, as there was an Austrian engine construction company with that name. Finally NSU Ro 80 was chosen as type name. Remarks: most of the modifications were carried out after summer-holidays, and so the new model year started. This varied from year to year. Chassis numbers were not always issued at production sequence, but also on date of invoice. It’s therefore that a car with a high chassis number could have been produced earlier than one with a lower number. Several pre-production cars were used for crash tests. Do you want to see more of these? Click CRASHES . 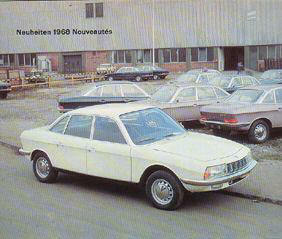 The introduction of the NSU Ro 80 at the International Car Show at Frankfurt, Germany. The Ro 80 becomes “Car of the year” in 1967; see all the details in this special on this site. The engine area is now in car-colour instead of black. Upholstery of the doors changed. Ventilation holes in thresholds. Some cars had silence-materials in the engine-area to deaden out engine sound, more or less the same as what was used at the underside of the car. On March 10, 1967 Auto Union GmbH merged with NSU Motorenwerke AG (Neckarsulm). 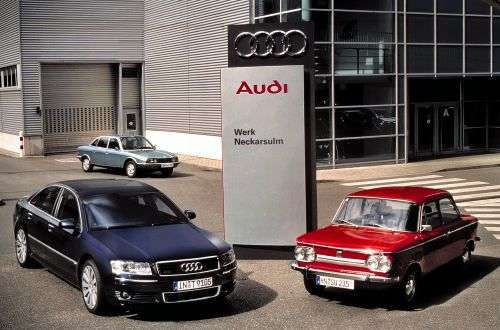 The newly formed company started life as per January 1, 1969 and was called Audi NSU Auto Union AG. This new company with its headquarters in Neckarsulm, expanded production from day one. Because of the first oil-crises from 1973, production dropped from 400.000 cars to 330.000 in 1974. 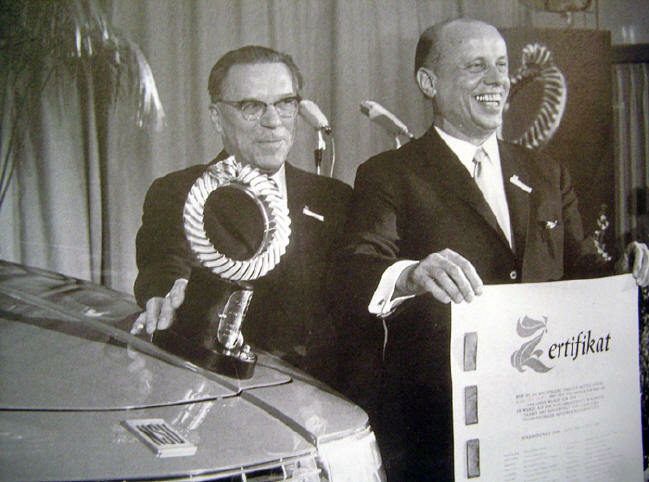 On the 1969 brochure at the left is explained why the Ro 80 is “Car of the year”.  The name NSU Ro 80 still exists. Red plastic cooling fan instead of aluminium one. The so-called “Hasenmuhle” program was launched to test Wankel engines with short rides. Cars were driven off and on from the factory to the small village Hasenmuhle, about a mile (1.500 meters) away. Here they were left for the engine to cool down again, and were then driven back to factory. It was found out that with the new Ferrotic seals wear one-fourth of that with the old seals. This gave a boost to engine reliability - it should now cope easily with 100.000 kilometres. Some 1.000 engines were tested by around 450 employees at the factory to achieve this result! Only one spark plug per rotor, high-tension ignition, and seals made from Ferrotic (Titanium). Headlights modified; separate lenses for low- and high beam. Aluminium grille replaced with cheaper plastic one. Switches and control lights on dashboard now with clear pictograms to identify their function. Windshield wipers with interval. 1971 Chassis number removed from parafan to right hand side of mudguard. 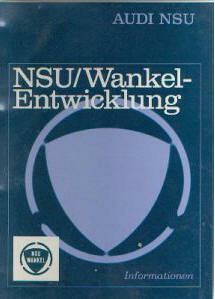 Down: a rare sample in German text of the theme's in a NSU/Audi press delivery from 1971. 1972 Front wheel mounting changed. Different shock absorbers, now aluminium. Automatic choke and new type of carburettor. Ignition box (8-connectors) now on rear panel of the engine compartment. 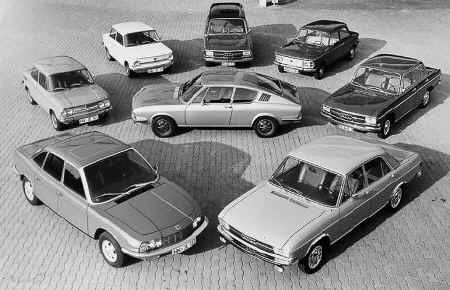 Picture with an overview of all models by Audi NSU in 1972. 1973 Disc brakes and drive shafts improved. New seating from Audi range, no longer height-adjustable. Double carburettors replaced with a single downdraft carburettor. 1974 Coolant fluid expansion holder now plastic. Carburettor with improved choke mechanism. Dynamo now with integrated voltage-regulator. Figures on speedometer and tachometer bigger . First and only major face-lift. (Bigger rear-lights, rubber strips on bumpers, Ro 80 badge at bonnet restyled, license plate now above bumper). By 1975 the car industry came back to ‘normal’ sales figures; this recovery was also visible at Audi sales. New bigger rear lights with built-in fog lamp; bumpers now with rubber strip. Bonnet lock changed. Ro 80 badge at rear modernised. License plate now above bumper. 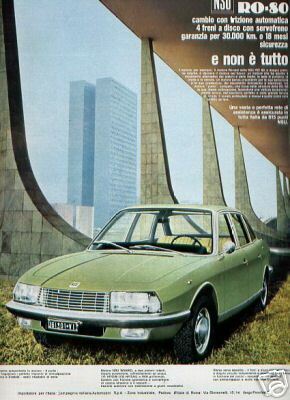 Exception: Switzerland/Italy: bumpers are divided in two separate units since model year 1976. The gearbox is improved and it’s ratios altered to receive the new developed engine, which unfortunately never made it to series-production. Oil metering pump altered. THE FINAL ONE Audi director Dr Habbel delivers the keys of one of the last Ro 80's build - a silver metallic with rallystripes- to the German museum for technic in Munchen. 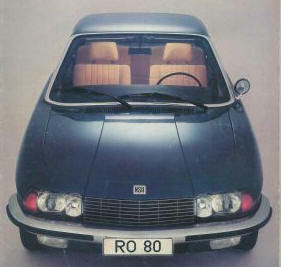 The final Ro 80 left the factory in April 1977. This meant, that after more than 100 years, the name NSU would cease to exist. After this date all cars leaving the factory in Neckarsulm bear the name Audi. At the picture left you see an image from the latest brochure. Approximately 37.500 Ro 80’s were built. Jan Hullegie owns one of the very last Ro 80’s made: a marsred project car, looking for a new owner. The very last Ro 80 is on exhibit in the Technology Museum in München, silver-grey with only 4 km’s on its odometer. This is one of the very very few original new cars that still exist today. I’ve been there, on my back to inspect the underside of the car… It was clear to see that this underside had the same colour as the body - no Unterbodenschutz here! 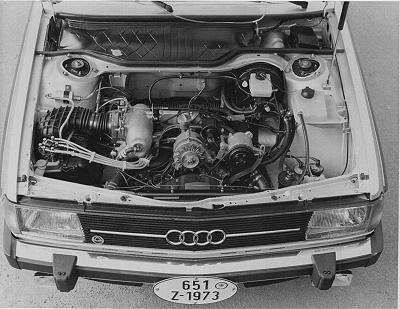 The new more powerful engine KKM 871 that was planned for the Ro 80 was tested in several Audi 100’s. On the site www.audi100-online.de by Oliver Wischerath you can find more information about this. Quite a lot of info about the Ro 80 as the Webmaster is a great fan of ‘our’Ro 80! Not much specific Ro 80 information is found here: it’s the general NSU Museum, so all products are at display. It’s certainly worthwhile to visit this Museum in Neckarsulm. You could also visit the former NSU-factory at Audi. Neckarsulm is rather a dull city; for more entertainment it’s better to drive on to Heidelberg. This already rare and sought-after book by Dieter Korp is regarded as “The Bible” for Ro 80 admirers. Dieter Korp is a well-known car-journalist, who published countless of articles about the Ro 80 and the Wankel engine in various German magazines, like Auto motor und sport. The Ro 80 book is only available in German, ISBN 3-613-01455-6, published by Motorbuch Verlag. Also by Korp is the even more rare publication “Protokoll einer Erfindung”, a detailed review of the history of the Wankel engine, also published by Motorbuch Verlag, ISBN 3-87943-381-X. Buy one if you find one! what is written there !!!!!! "bible" accessible to me !!! your comments on that or any better idea > > Ciao ! "Conceived in the 1930s, simplified and successfully tested in the 1950s, the darling of the automotive industry in the early 1970s, then all but abandoned before resurging for a brilliant run as a high-performance powerplant for Mazda, the Wankel rotary engine has long been an object of fascination and more than a little mystery. A remarkably simple design (yet understood by few), it boasts compact size, light weight and nearly vibration-free operation. In the 1960s, German engineer Felix Wankel’s invention was beginning to look like a revolution in the making. Though still in need of refinement, it held much promise as a smooth and powerful engine that could fit in smaller spaces than piston engines of similar output. Auto makers lined up for licensing rights to build their own Wankels, and for a time analysts predicted that much of the industry would convert to rotary power.